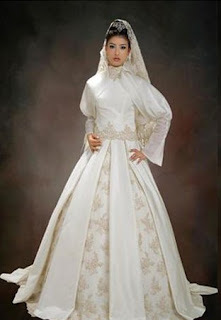 In the past, I've posted Turkish bridal hijab styles and how to wrap them, but this time the focus is on the dresses. Bala Couture is a brand that specialises in bridal and evening dresses, inspired by traditional Turkish and Ottoman designs. 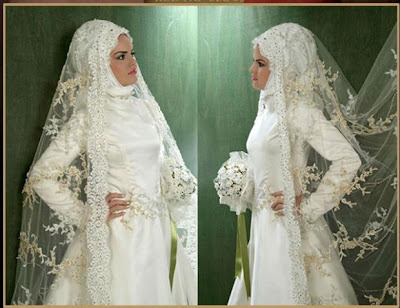 They have a beautiful selection of hijab-friendly dresses, and although most of us can't get our hands on them, they can provide some inspiration if you plan on making your own. One thing I do dislike though, again, is the strapless dress with a long sleeve top underneath concept, as seen in the first two pictures. Visit their website to see lots more pictures, and check out their absolutely stunning collection of evening dresses. LOOL at the pop corn dress! I agree, the long white sleeves under the strapless dress looks BAD! A polero looks MUCH better. um not sure about the conehead style! 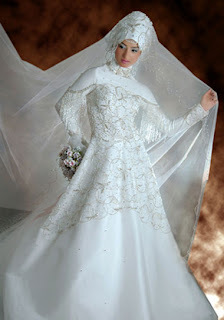 I wonder if the models are Muslim hijabis though because you can see a lot of their hair in some of the head coverings. Most models aren't muslims all because most muslim women don't want men to be able to stare at them. I like the last one with the pink hijab. Very pretty. LOL, I agree about the lycra---reminds me of the tour de france. He he. Popcorn and coneheads. Boleros I also don't like, nada. They make me think bull-fighter and or line dancer. Sorry!!!!!! OMG Jana I love it!! Your blog brings a little fashion into my otherwise dreary days. Nihad, lol I'm glad someone likes it! Anon 2, thank you, I'll look into it! Tabassum, Bala Couture are not just a Tesettur brand. 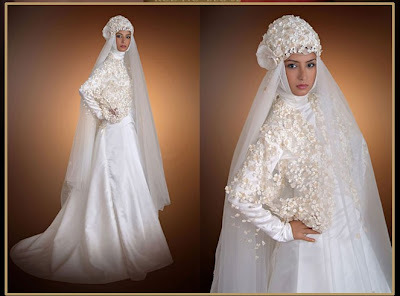 So whilst some of the dresses may be hijabified, they're not necessarily being marketed as such. Alix, I agree with Anon 4. Turkey is 99% Muslim, so you can bet that most Turkish models are too, although most of them do not wear hijab. They're still Muslim! Ms Zammil, am I invited? 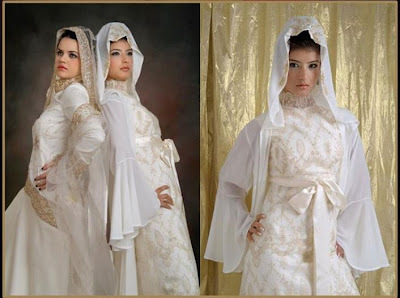 Anon 4: Living in the Gulf (khaleej not Turkey) the models were either not-practicing muslims (not praying five times a day in ther very least) or they were imported models from Russia and Europe. And pretty foreigners living there are approached for pictures and modeling all time. Okay, so if that woman is muslim, she is PROBABLY not a full-time hijabi. But we should discuss about the dress here, not the model. lol the popcorn dress looks funny you dont want people making fun of you on your wedding day lol!! There is a wonderful modest bridal & evening gown boutique in Teaneck NJ that is located right outside of new york city that has gorgeous gowns that are very fashion forward. It's called Couture De Bride and their web site is www.tovamarc.com They also ship all over the world. Their prices are very reasonable and they can custom design gowns too.